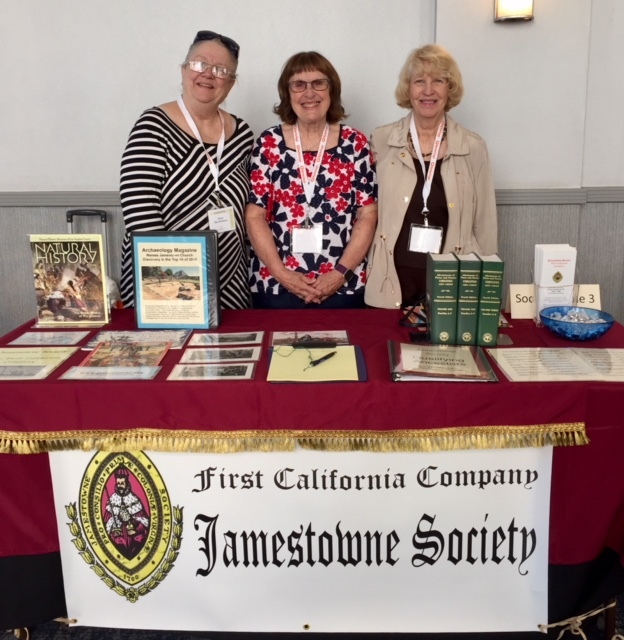 News | First California Company, Jamestowne Society | Were your ancestors living in Jamestowne in 1607-1700? 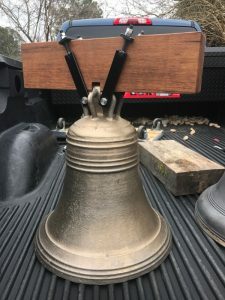 Our Society has been supporting, through contributions from its resources and donations from members (like you), the replication of the bell that once hung and rang from the tower of the early church on Jamestown Island. That bell has been replicated and will be displayed and played at the commemoration events this coming July. 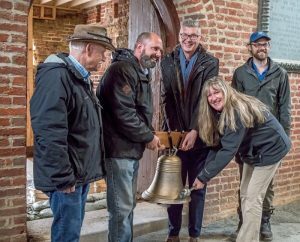 Bonnie Hofmeyer, our Executive Director, recently was among the Jamestowne Rediscovery group that welcomed the replicate bell to where the fragments of its progenitor was found and used for the replication. Jamestowne Rediscovery has described how it happened. 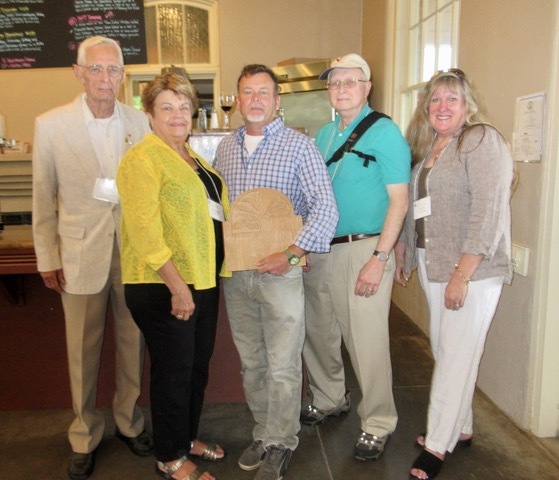 JR Welcoming group: Pictured: Dr. Bill Kelso, Michael Lavin, & Dr. Jim Horn of Jamestown Rediscovery. Benjamin Sunderlin, Owner & Campanologist of the B.A. Sunderlin Bellfoundry. 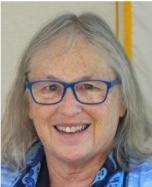 Bonnie Hofmeyer. You can also hear Bonnie ring the bell in this very short (12 second) Facebook video by Cindy Deuell. 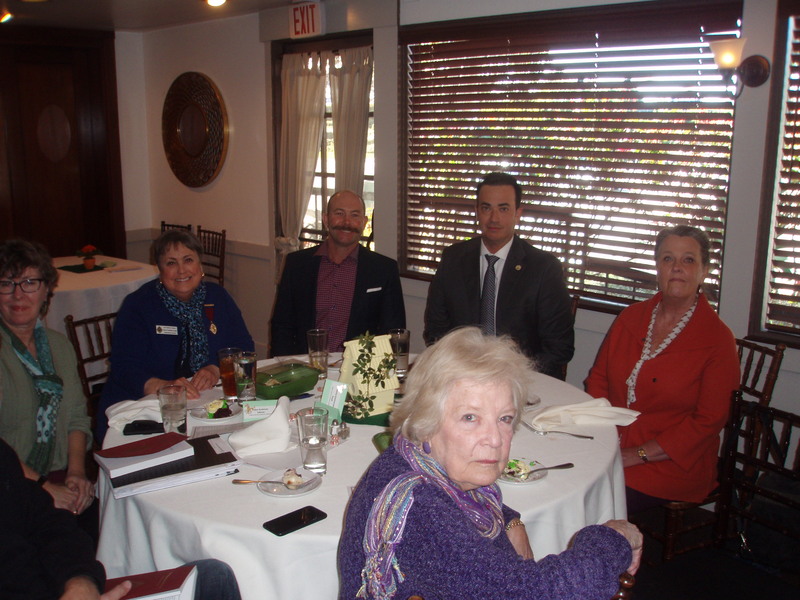 Thirty First California Company members and guests attended our 2019 winter meeting at Baily’s Restaurant in Old Town Temecula on Saturday, January 26. Governor Julie Plemmons convened the meeting at noon. Membership Chair Martha Gresham introduced and welcomed new member Ellen Anderson. “1619 was significant as marking the first time African slaves arrived at the first permanent English settlement in the New World – Jamestown. Of course, the Spanish had the first European permanent settlement in what is now the U.S. in St. Augustine, Florida. “Spain became the richest country in the 16th and 17th centuries as they reaped the riches of conquests in Mexico and Peru. Other European countries aspired to emulate the wealth gathering that made Spain the envy of the world at that time. Spain enforced their claim to the New World by aggressively attacking whomever they viewed as interlopers. The French Huguenots at Fort Caroline (in what is now Jacksonville, Florida) were wiped out by the Spanish at St. Augustine in 1565. “The Virginia Company of London, in financing the new settlement in Virginia, specifically advised the settlers to establish themselves sufficiently upstream to better guard against Spanish attack. The James River and Jamestown Island appeared to satisfy the goals of protecting against Spanish attack as well as Indian attack. What the location did not offer was gold and silver like Mexico and Peru. That lack of easy riches led to challenging times for the Jamestown settlers. FCC Governor Julie Plemmons and Lt. Governor Marty Sommercamp with our speaker, Michael Oddenino. “African slaves were in other parts of the world at that time. The Arabs had been taking Africans as slaves since the seventh century into the 19th century. Blacks had been enslaving other blacks in Africa for some time by 1619. The Portuguese had been taking slaves from the west coast of Africa to the New World in the 16th and 17th centuries. They also enslaved Brazilian Indians at that time. White Europeans were being taken as slaves in the 17th century by Arabs in North Africa. The majority of the population in Russia in 1619 was made up of white serfs, who were slaves by another name. “The arrival of the first Africans to Jamestown in 1619 wasn’t a race issue, rather a labor issue. Throughout history slavery was more a function of the spoils of war rather than a race issue. A fascinating significance of 1619 in Jamestown is that approximately one month before the arrival of the Africans, the first representative assembly in America was convened. 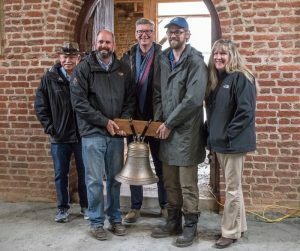 Virginia Company officials sought to promote the Jamestown settlement as being governed by the rule of law, that is to say, that all people are created equal under the law. We have 67 members, a net gain of 11 members since last year. Our meetings averaged 40 in attendance. Our Annual Meeting and the 20th anniversary of our company will be held in late spring. A special program us is being planned to complement the Society’s 400th anniversary commemorations of 1619 events in late July. 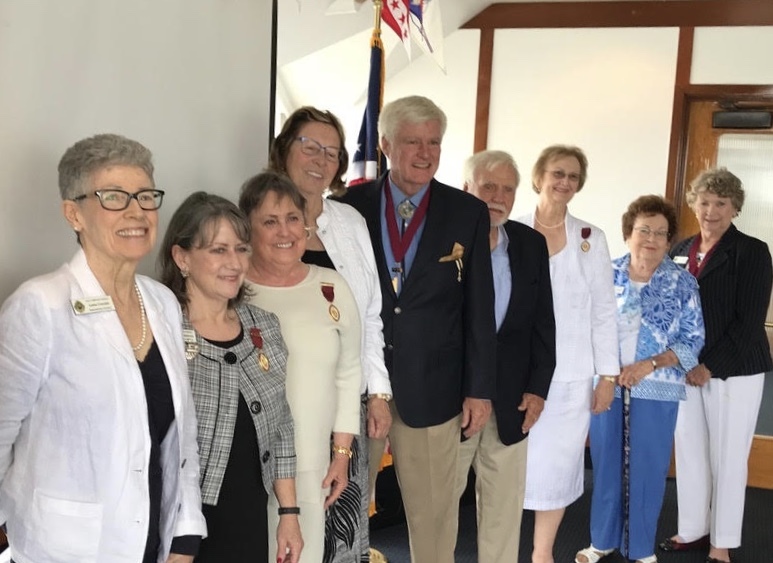 Seven Southern California residents have been admitted as new Jamestowne Society members since our last meeting and one has joined us. The rest were our members’ children or grandchildren. Member Sandy Krutilek will host our table at the Southern California Genealogical Jamboree on Saturday, June 1. She is working on a new display for our table. Our next meeting will be held at noon on Saturday, January 26, 2019, at Baily’s Restaurant, Temecula, CA; The program will be The 400th Anniversary of the Landing of the First Recorded Africans in Virginia. 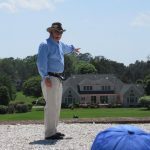 Our presenter will be Michael L. Oddenino, who lectures on a variety of historical subjects including the Civil War, and portrays Patrick Henry delivering his famous “Give Me Liberty or Give Me Death” speech. He is a University of Virginia School of Law graduate and practicing attorney in Arcadia, California. The cost of the luncheon and meeting is $40. The meal choice is chicken schnitzel, medallions of pork tenderloin or baked salmon. Please make your check payable to First California Company, Jamestowne Society and mail to Treasurer Richard Burke, 1810 W. Northern Ave A-5 153, Phoenix, AZ 85021-0965. Your reservation must be received by January 18, 2019. For more information or details, please contact Governor Julie Plemmons at jpnkids@yahoo.com or 619-207-7006. 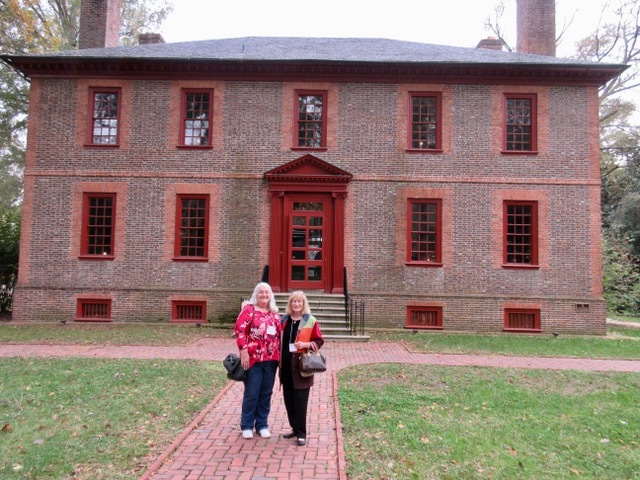 The Jamestowne Society’s 2018 Fall Heritage Tour gave me the opportunity to visit my ancestral Randolph homes, Tuckahoe and Wilton, near Richmond, Virginia on November 2. William Randolph and Mary Isham Randolph of Turkey Island Farm are considered the Adam and Eve of Virginia as their children married into all the other First Families of Virginia. Their descendants include Thomas Jefferson (3rd President of the United States), Robert E. Lee (commander of the Army of Northern Virginia during the War Between the States), John Marshall (Chief Justice of the Supreme Court), Peyton Randolph (President of the Continental Congress), Richard Bland II (member of both Continental Congresses), John Randolph of Roanoke (Congressman) amongst many others….including me as William Randolph and Mary Isham Randolph are my eighth great grandparents. Elizabeth Randolph and Richard Bland I are my seventh great grandparents. William Randolph and Mary Isham Randolph had at least 9 children. Their first son was William Randolph II, whose son, William Randolph III, built Wilton. Thomas Randolph of Tuckahoe was the second son of William Randolph and Mary Isham, who began construction of Tuckahoe around 1714, located near Manakin, Virginia. Their third son was Isham Randolph, whose daughter, Jane Randolph, married Peter Jefferson; Thomas Jefferson was their son. William and Mary Isham Randolph’s ninth child was Elizabeth Randolph, as mentioned above. 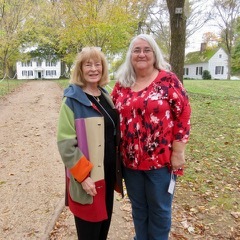 It was a thrill to participate in the tour with my friend with my friend Susan McCrobie (2017-2019 Councilor and Communications Committee Chair) to visit my ancestral cousins’ homes. The group was divided into two buses. 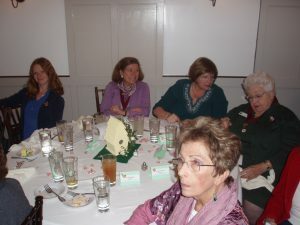 One went first to Tuckahoe and then Wilton, where we had a box lunch and the other group did the opposite. Our group leader was Anne Stokes Moore, (2017-2018 Historian and Special Events Committee Chairman), who did a great job. 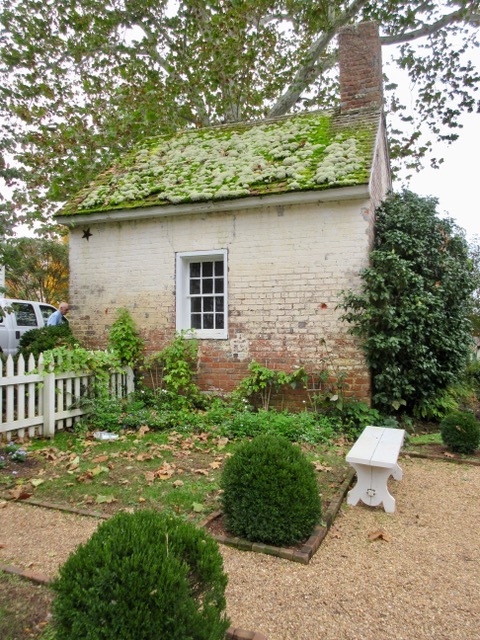 Tuckahoe is the only early Randolph home still standing on its original site and was built by Thomas Randolph. Another William Randolph III, Thomas’s son, built a two story, four room house in 1733 around the original structure. Later, a center hall and south wing were added, creating an H shape. The home is located on a bluff overlooking the James River. William’s wife died in 1744 and William in 1745 leaving young children. In his will, he asked that his cousin Jane Randolph (Jefferson) and her husband Peter Jefferson come to the Tuckahoe Plantation and care for their three orphaned children until his son, Thomas Mann Randolph Sr. came of age. 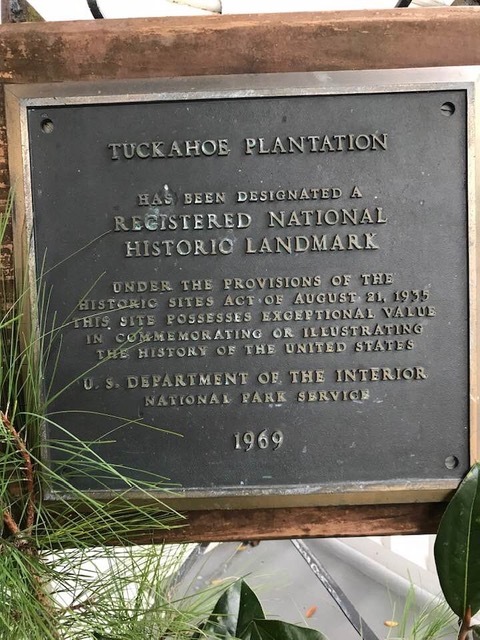 Tuckahoe has been privately owned and lived in by distant descendants of the Randolph’s since 1935. 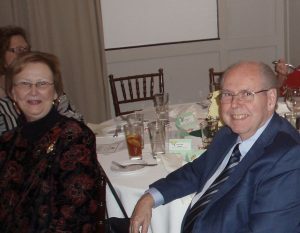 Majority owners are Addison B. Thompson and wife Sue as well as his sister and brother, Jessie Ball Thompson Krusen and William T. Thompson III. As mentioned, Wilton was constructed in 1753 by William Randolph III, son of William Randolph II and grandson of William Randolph and Mary Isham Randolph. The manor house was on 2,000 acres of land located on the north bank of the James River several miles east of Richmond. None of the three subsequent male descendants lived to the age of 40. The fourth descendant in line died at the age of 29, leaving Wilton to his daughter, Catherine. As the property was deeply in debt, she filed suit to sell Wilton in 1856 and was the last Randolph to own Wilton. Wilton changed owners four times before going into foreclosure. 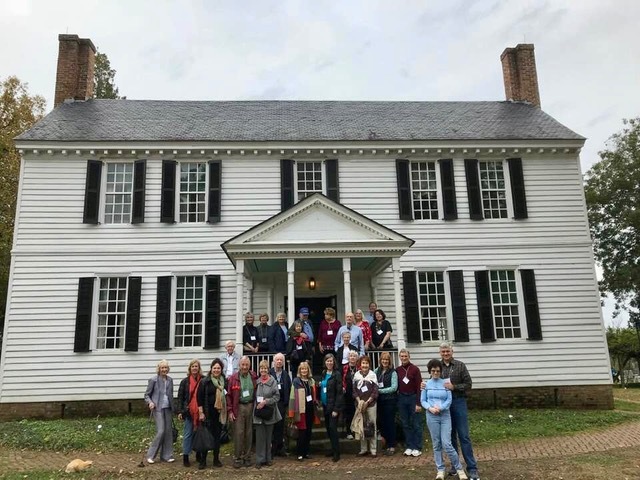 The National Society of The Colonial Dames of America in the Commonwealth of Virginia saved the home from demolition and became the final and present owners of the house. It was carefully dismantled and categorized for removal to its present home, south of Richmond on the north bank of the James River. It is a two-story building, a museum in a historic home, which had to be rebuilt. Not only rebuilt but refurnished as nothing in the home had remained. 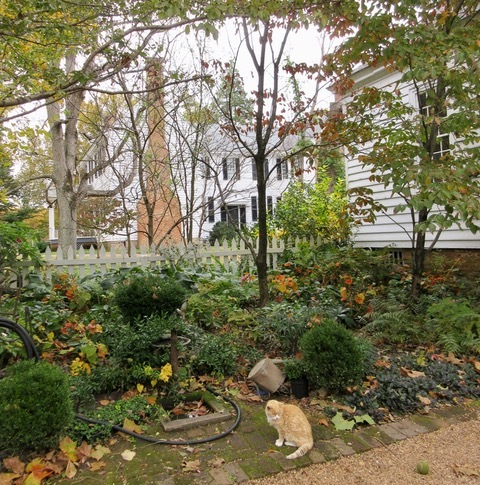 Both properties are beautifully kept up…One is lived in and one is a museum. They both can be visited, which I highly recommend. I had a personal interest in viewing them but everyone on the tour thoroughly enjoyed this unique learning experience. Tour group at Tuckahoe. I am in the front in my Coat of Many Colors. Tuckahoe with the friendly resident cat, who followed us all around the grounds. 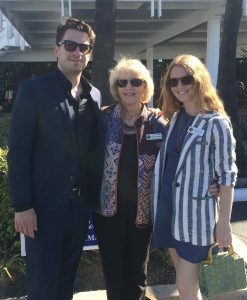 Governor Julie Plemmons (left) with new members Tyler Jackson and Liza Leif, and Past Governor and Membership Chair Martha Pace Gresham. 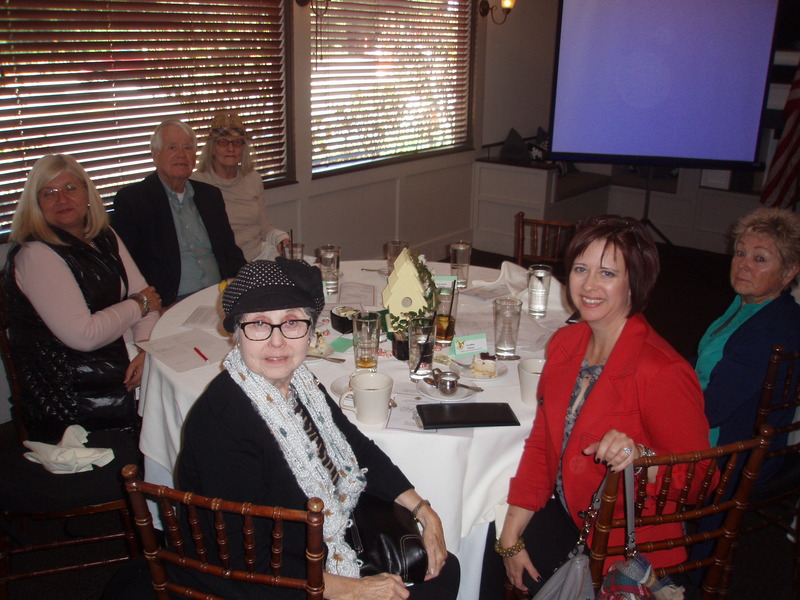 Our Fall 2018 membership luncheon and meeting was held at the Long Beach Yacht Club at noon, Saturday, October 20. 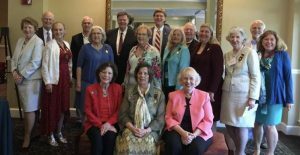 Governor Julie Plemmons welcomed forty members, Friends and guests. 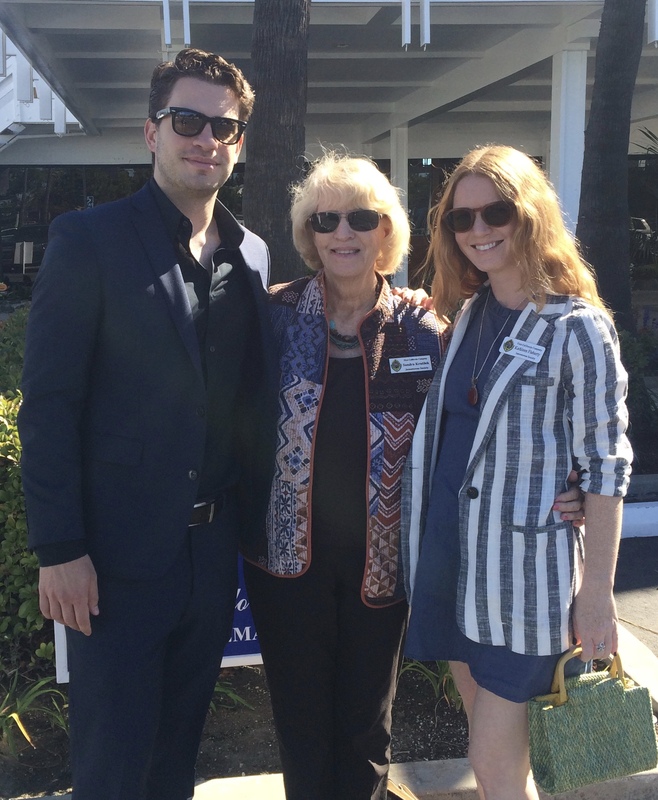 Membership Chair Martha Pace Gresham then introduced new company members Tyler Jackson and Lisa Leif. Historian Jim McCall noted that, at its events beginning July 27, 2019, the Society will commemorate the 400th anniversaries of the convening of the first General Assembly and arrival of the first Africans into English America. This will replace the customary May events. He also shared a new book: 1619; Jamestown and the Forging of American Democracy, by Dr. James Horn. Governor Plemmons also urged all to see Jim’s article in the Society’s Fall 2018 magazine. 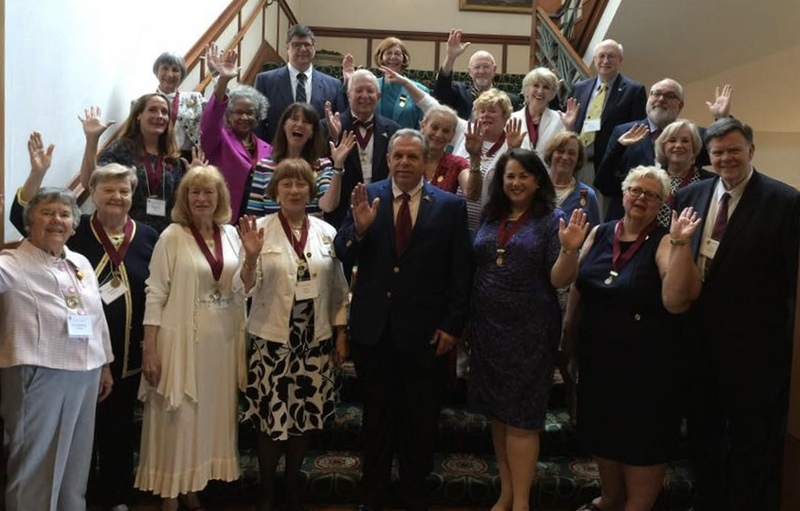 Past Governor Ginny Gotlieb, who is serving as a Jamestowne Society Councilor through 2020, reported more details of events that will be held July 27-30, 2019. Activities will take place on Jamestowne Island and at Kingsmill Resort, Williamsburg, VA, and reservations are now open. She recommended reserving early as luncheons and other space constrained events sell out early. A letter will be coming soon regarding supporting this 400th Commemoration and the archaeological work being done on Jamestowne Island. The Roll of Honor recognizes gifts from companies as well as from individuals. A program will begin next year to honor individual burgesses. All are encouraged to support these 2019 events. Both Jamestown, founded in 1607 by the Virginia Company of London, and Plymouth, founded in 1620 by English religious separatists, were products of the English drive for New World colonization as those of Spain and other major powers. Smith returned to the New World in 1614, explored the New England coast and went home to publish A Description of New England, in which he described how it was ripe for colonization. The religious separatists then living in Holland must have seen the book. They had decided they needed to relocate and decided they would try colonization. The third figure, and ultimately most important, was Sir Edwin Sandys. Sandys was a principal officer of the Virginia Company and deeply committed to successful English colonization in the New World. He played a major role in keeping Jamestown going, including calling for the first elected representative body in Jamestown and conceiving the sending of 100 “maidens” to Jamestown to help stabilize the colony. He was the son of the Bishop of Yorkshire, whose ecclesiastic seat was Scrooby. The Bishop’s manor was rented by the family of William Brewster, who would become one of the leading figures in the separatist community in Holland. In 1617, Brewster wrote to his old friend, Sandys, for help in transporting the separatists to the New World. The ship’s passengers, however, included both separatists and secular colonists, and there was a question as to who had authority to govern. In the end, all the men who were going to stay in the new colony agreed to a written accord of self-government, which we call the Mayflower Compact. It recognized that they were loyal subjects of King James and, being about to engage in democratic government, is certainly reflective of the influence of Sir Edwin Sandys. The influence of Edwin Sandys on the language and content of the Compact is obvious. There would have been no Mayflower had Jamestown not been established first. Following the program, Governor Plemmons convened the Membership Meeting and announced that we have plans for the coming two years focusing on the major 400th commemorations. She announced that ten new members have joined the company since June. 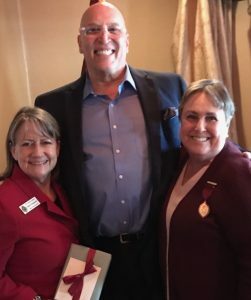 Lieutenant Governor Marty Sommercamp reported that we have scheduled our 2019 Winter Meeting for Saturday, January 26 and is seeking suggestions for an appropriate venue in Riverside County. Her email contact is in the recently distributed Yearbook and also on our website. Governor Plemmons commended Treasurer Rick Burke for his major efforts to reorganize, update and complete the company’s financial records and accounts. His Treasurer’s report was presented and adopted and an amended 2019 budget was adopted. Governor Plemmons also reminded the membership and Friends of the Company to submit their dues as soon as possible as the October 1st due date has passed. 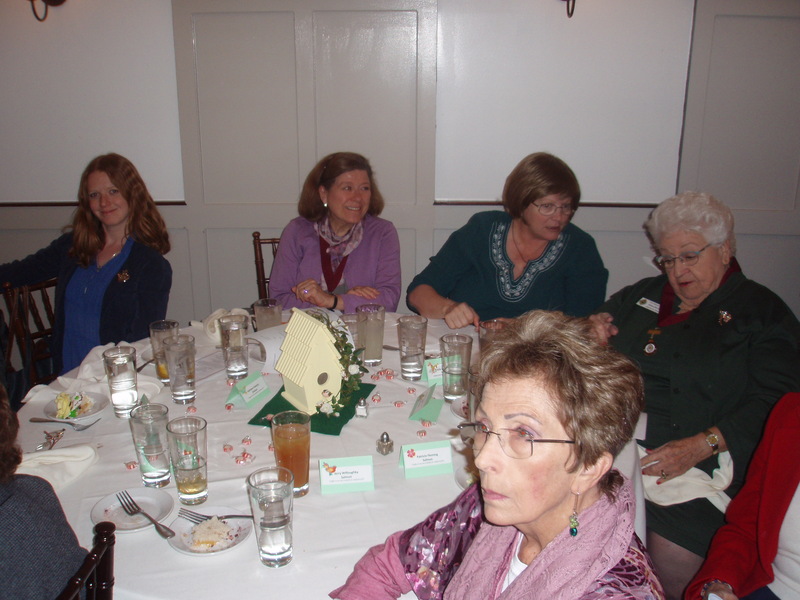 She reiterated that membership is open to those who are Jamestowne Society members. 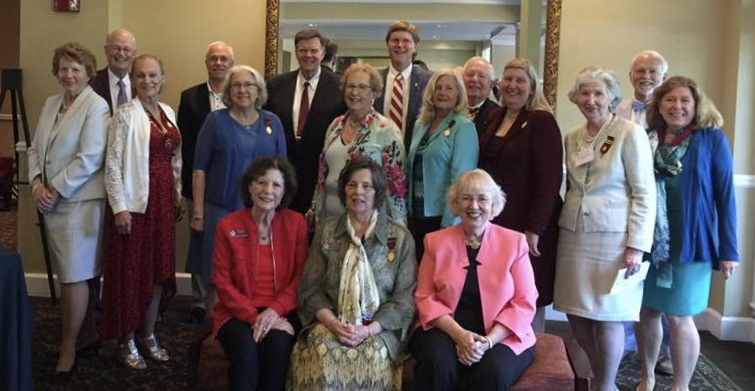 Friends of the Company are individuals who are not yet Jamestowne Society members but would like to support our ongoing programs and be included in luncheon invitations and news of the Society via our blog. Chaplain Sandy Bill conducted a brief memorial service for members Anita Guenin and Terry Whitcomb who had recently passed away. 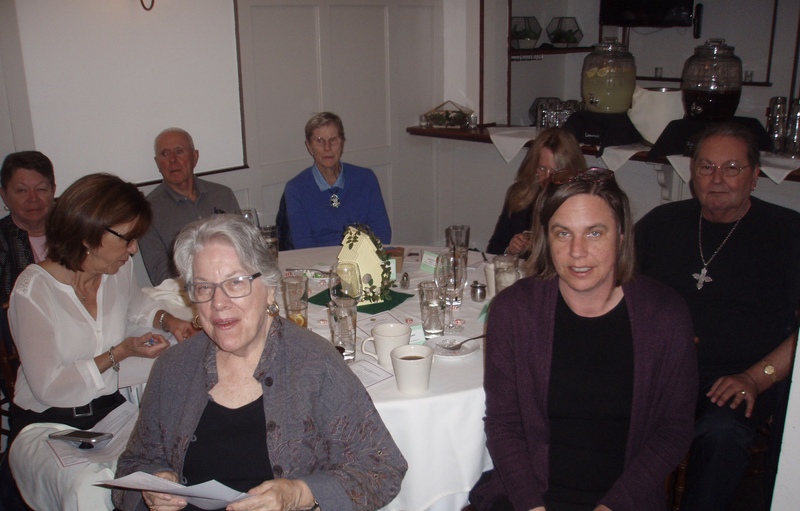 Membership Chairman Martha Gresham encouraged those close to submitting their applications to do so prior to the end of the year as the membership and supplemental fees will then be increased. Chaplain Bill provided the benediction and the meeting was adjourned at 2:10 pm. Member Sandy Krutilek (center) with her grandson, Chris (left) and granddaughter, member Kathleen Flaherty. We know that there were few women colonists in the first years of the Jamestown colony. As with almost all European colonies, men were the adventurers, going out into the wilderness with the idea of making their fortune and going home. It is hard to get a firm figure as to how many women left England to go to Jamestown in the early years. Except for a couple of ships, we don’t have passenger lists and the death rate in Jamestown was so high that it obscures the identities of the first women. But we can get a handle on this. On a recent visit I made to the Historic Jamestowne archeological site, our guide from the National Park Service explained that the men were not farmers. Although the 1606 Charter issued by the King to the Virginia Company of London commended it to Christianize and civilize the native population, most of the colonists came mainly to find gold, as the Charter authorized. In England, women performed the important task of brewing beer. Beer was critical because in Jamestown, as in England, stream water was not safe. Almost everyone drank beer, because the brewing process produced a safe drink. Home vegetable gardens were also a women’s specialty, and we know how hungry the settlers got. Lack of women was a significant factor in the hardships of the first years of the colony. We have passenger lists for the first colonists to journey to Jamestown. The very first in 1607 included 144 men and boys, of whom 104 remained in the new colony. Only 38 were still alive when the first supply ship arrived in 1608. The First Supply arrived with no women passengers. The Second Supply came in October of 1608. It brought 70 passengers, including two women, Mistress Forrest, the wife of one of the settlers, and her 14-year-old maid, Anna Burras. Mistress Forrest disappeared from records, probably dead, but Anna survived, married John Laydon and lived until at least through 1627. Then, there is the Third Supply of 1609, the most famous of the supply convoys. By this point, the Virginia Company of London, which established the colony, was actively recruiting family groups. Broadsheets were being circulated around England. The Third Supply, for which we have no complete passenger list, was made up of nine ships, including the flagship Sea Venture. Historians have estimated that the convoy included 400-500 passengers, including somewhere between 30 to 100 women and children. A count of about 40-50 seems reasonable to me. Seven of that Supply’s ships, but not the Sea Venture, made it to Jamestown by fall 1609. One of the women of whom we know was Temperance Flowerdew. She went back to England, but then returned in 1619 as the wife of Governor George Yeardley. She later married Governor Francis West and remained in Virginia until her death in 1627. Two others, Joan Peirce, and her daughter Jane, were the subjects of an historical novel. The Sea Venture carried 153 passengers, which included women and children, e.g., the pregnant first wife of John Rolfe. She and the baby died on Bermuda. A reconstructed passenger list for the Sea Venture shows about 15 women, wives and servants. They made an unintended stopover of nine months when the ship was wrecked on Bermuda. Most of passengers and crew survived and finally arrived in Jamestown in May 1610 aboard two self-built smaller boats. At this point, London was shocked with lurid stories of cannibalism and, in particular, one husband who, during the Starving Time, murdered his wife for his own consumption. JR3081F, James Fort Site, Jamestown Virginia. Sculpted bust by Jiwoong Cheh. Coif head covering by Aimee Kratts, Costume Researcher. Reconstruction funding provided by Roy E. Hock and Margaret Nelson Fowler. Those stories were somewhat doubted for over four centuries until 2012, when the archeological team at Jamestown made a stunning discovery of a partial skeleton, whom they named “Jane.” She was a teenager who had died in the Starving Time and been butchered for human consumption. 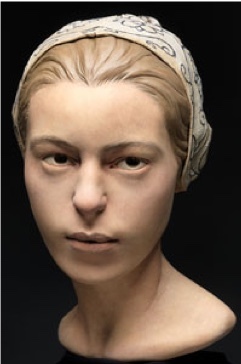 Doug Owsley, the Smithsonian Institution’s noted forensic anthropologist, and Jamestown Rediscovery’s William Kelso spent considerable effort trying to identify her. She appears to be of the servant class, rather than gentry. They do not think that she was the murdered wife. With the May 1610 arrival of the Sea Venture’s survivors, the population of the colony was up to about 230. In June, three more ships, led by new Governor Lord de la Warr, arrived from England, just as the survivors were setting out to abandon the colony. They were compelled to stay. This would be the Fourth Supply. Again, we do not know if there were women in this group, although that would have been likely. More ships came over the next few years with mostly male passengers, but the population in Jamestown itself continued to decline. In August 1611, Thomas Gates brought in a fleet of three ships. The passengers included 20 women, including his wife and daughter but his wife actually died before landfall. A researcher named Anne Stevens, on her site Packrat Productions, has created a source-based list called Pilgrim Ship and Passenger Lists, listing all the ships which sailed to Virginia and New England starting in 1607 through 1638 with reconstructed passenger lists when possible. Two examples of the information she provides show that the John and Francis arrived in November 1614 with 34 men and 11 women, and, in 1617, the Treasurer brought 11 men taken from the Neptune. A number of the ships are shown as carrying only male passengers. In 1616, John Rolfe reported there were 65 women and children in the colony in a population of 351. By then, the establishment of new settlements near Jamestown was underway. The Bona Nova left London in 1618 or 1619 with approximately 120 passengers, of which six were women, who then appear in the 1624/5 muster. Not all of the missing was dead. Some settlers went back to England. The Spanish ambassador to England in 1612 claimed that some 40-50 colonists had deserted the colony to take Indian wives and were living in their villages. It is hard to know if his claim is trustworthy. On April 10, 1619, the new Governor Yeardley arrived with his wife, the former Temperance Flowerdew. Per one of Stevens’ reconstructed passenger lists, there were approximately 15 women on board his ship, again either as wives or servants. Altogether in 1619, another 1,440 colonists were sent over. Notably, the Margaret led by Captain Woodlief, arrived in late 1619 with 35 passengers for which we have a passenger list, all men. Its arrival was celebrated with a Thanksgiving prayer service. By the spring of 1620, there were just over 1,000 colonists in all of Virginia; not just in Jamestown but also in the surrounding settlements. Not all were English, mind you, as the Virginia Company had also been recruiting on the continent for skilled craftsmen since the colony’s inception. 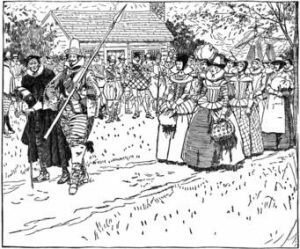 On 3 November 1619, Sir Edwin Sandys, the newly elected presiding officer of the Virginia Company, proposed sending 100 marriageable “maids” to Virginia to ensure its stability and survival. At this point, the Company undertook active recruiting of selected single females, complete with vetting of their qualifications and some very nice perks, clothing, personal goods, food and shelter when they arrived, and their choice of accepting or not accepting any of the men as husbands. In May and June 1620, pursuant to the “Maids for Virginia” project, the first “maids,” 90 women arrived on the Jonathan and the London Merchant. In the next few years, more ships brought both single women and married women to Virginia. In 1618, the Company made land grants to “Ancient Planters,” defined as individuals who had come before Governor Thomas Dale left the colony, i.e., 1616, who had paid their own passage, owned at least one share of Virginia Company stock, or were otherwise qualified. A list of those to whom the grants had been made was compiled in 1623 or 1624 when the colony was about to be turned over to the Crown. The list has been reconstructed and shows 149 Ancient Planters, including 15 women. In March 1620, a general muster of all of Virginia was taken and showed 892 persons of European descent. About 6/7 of them were male. Also present were 32 Africans, of which 15 or 17 were female. In June of 1620, Edwin Sandys submitted a statement to His Majesty’s Council reporting that at that point there were 1,200 people in Virginia who had come in the last year, and a thousand from earlier years. He refers to the new arrivals as men. By 1625 most of the colonists were no longer living in Jamestown itself, but instead in neighboring settlements along the James river. The 1624/5 muster roll of all of the settlements in Virginia, which was an all name census, showed 124 people living in Jamestown itself, out of a total population in Virginia of 1218, ¾ of which were male, i.e. there were about 300 females. 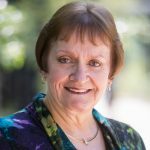 Historical novelist Connie LaPallo, studying the muster, has concluded that 5 were women who had come as late at the third Supply, i.e., 1610. I too have looked at the muster to confirm her claim. From the 1616 census, list of land grants to Ancient Planters, 1620 general muster and 1624/5 muster, it is easy to see that most of the women present in Virginia in 1624 had come since 1620. The 1624/5 muster took place after a major attack on colonists by the Indians in March 1621/22, which killed approximately 347 colonists. Assuming the same percentage of women were killed as men, and the fact that most of the women in the colony at that point were later arrivals, it would not significantly affect my calculation as to how many women had come as of 1620. But as I said at the beginning, the awful death rate does make it hard to count how many women had come as colonists. So, I calculate that, prior to the arrival in 1620 of the first “Maids for Virginia”, thousands of men had come to Jamestown but only about 100-150 women colonists. There were only two women prior to the fall of 1609. The Third Supply brought perhaps 40 women. In the period from 1610 to 1619, while most of the ships brought no women, a few seem to have brought some wives and servants, often no more than one or two, and one or two bringing 10-20 at most. In 1616 there were 65 women and children in Jamestown. A generous estimate would assume that 50 women were adult women. Most of the sources are not wholly trustworthy but consistent enough on which to base a reasonable estimate. My estimate is also consistent with the award of land to Ancient Planters, 1620 muster, and 1624/5 muster, which showed very few women from earlier times. This is my figure, but it is also similar to the estimate made by the National Park Service of 100 women had come to pre-1620 Jamestown. And, obviously like the men, the vast majority of the women colonists met early deaths. Life was very hard indeed for the first colonists. Marcia A. Zug, Buying a Bride, An Engaging History of Mail Order Matches, New York, 2016. 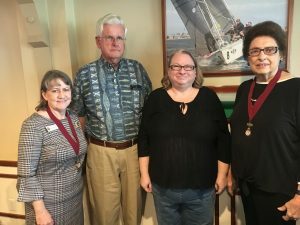 Our program, How the Jamestowne Colony Led to the Sailing of the Mayflower, will be presented by Erica Hahn, a First California Company and Jamestowne Society member since 2013 and past Governor of the Orange County Colony of the General Society of Mayflower Descendants. The luncheon will cost $40 and be an Italian buffet of penne pasta with marinara or sausage velouté, mixed grilled vegetables, fruit salad, mixed Italian salad, garlic bread, and dessert. They must be received by Wednesday, October 10, 2018. Please include your name (and others in your party, plus Email and Phone, and indicate whether a member, Friend, prospective applicant or guest. 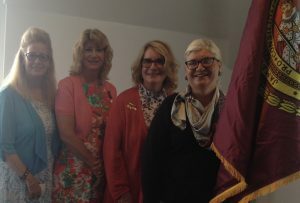 Our 2018 Annual Meeting was called to order at 12:05pm on Saturday, June 23rd by Lieutenant Governor Julie Plemmons in absence of Governor Scarlett Gathings Shepherd at the San Diego Yacht Club, 1011 Anchorage Lane, San Diego. 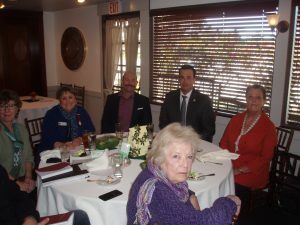 We had 36 in attendance, 20 of whom were members of the Society and First California Company, plus nine guests and seven prospective applicants. Chaplain Sandra Orozco delivered the Invocation and Councilor and Past Governor Donna Derrick led the Pledge of Allegiance to the Flag of the United States of America; the attendees then introduced themselves. FCC welcomed our new members; from left to right: Lori Darnell; Denise Lonngren; Susan Astarita; Kathleen Beall. The new members introduced themselves to the group and shared some info about their Jamestowne ancestor. There also were six prospective applicants in attendance, so we are looking forward to some additional new members soon. Membership Chair Marty Sommercamp welcomed four new members who were present, Lori Darnell; Denise Lonngren; Susan Astarita and Kathleen Beall. 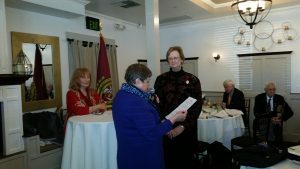 New member Ellen Anderson was absent. 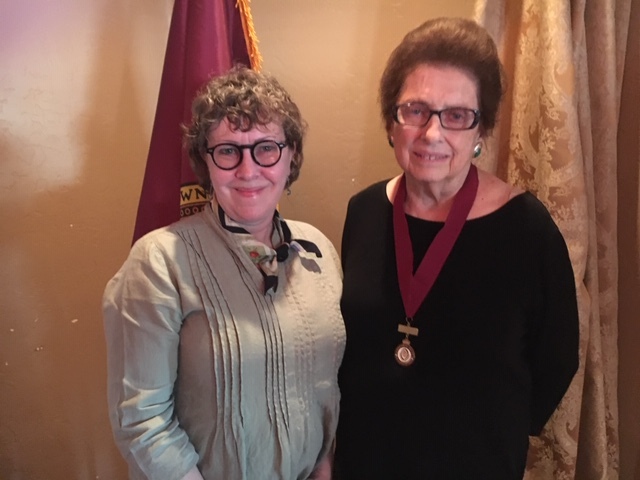 Bonnie M. Harris, Ph.D. made a presentation on A Foundation for Revolution: The Intersection of Religious and Civic Life in Jamestowne, 1607 to 1777. She related how the Virginia Statute for Religious Freedom was a statement about both freedom of conscience and the principle of separation of church and state. Proposed first by Thomas Jefferson in 1777 and passed by the Virginia General Assembly on January 16, 1786, it was the forerunner of the first amendment protections for religious freedom, which was considered a natural right that could not be infringed upon. Religious tolerance and freedom were not practiced in early to mid-17th century New England and Plymouth as the Puritans had created what was essentially a theocracy, but were given more leeway in Virginia. She traced the 300-year history of religious dissention that began in the 16th century, down through the English 17th century colonization of Ireland to impose conversion through exploitation, the wars among the English, Dutch, French and Spanish in the 17th century and the establishment of Virginia as a royal colony in 1624, when the General Assembly openly tolerated other sects and dissenters. Religion was governed locally by vestries in Virginia as no Anglican bishops were seated. The governing elite consolidated religious and civic issues and tolerated religious diversity, which fostered civic dissent. Our Revolution actually began in the 1760s with a change in general religious sentiment during the French and Indian War and violent reactions to the Stamp and Declaratory Acts, leading to Virginia’s 1786 enactment of the Statute and, soon after, adoption of our First Amendment in our Constitution in 1789. Lieutenant Governor Plemmons then read Governor Shepherd’s report and announced that the next company meeting would be scheduled when the new Council arranges it. The membership ratified the findings in the Financial Review Committee’s report by Jim McCall and Jim Shepherd that had been accepted by the Council earlier. Treasurer Suzy Leif presented her report. Chaplain Orozco led a moment of silence and remembrance for our recently deceased former member Thelma Yates. Jim McCall reported that the National Parks Conservation Association, National Trust for Historic Preservation and Preservation Virginia had jointly filed new appeals of the DC Circuit Court decision in favor of the US Army Corps of Engineers permit to allow Dominion Energy to begin construction of the towers across the James River near Jamestown. Lieutenant Governor Plemmons presented Sandy Krutilek’s Report on the Southern California Genealogy Society’s 2018 Genealogy Jamboree. Jim McCall reported on plans for the Society’s 2019 commemorations to mark the 400th anniversary of the first representative legislative assembly in North America, as well as the arrival of the first recorded Africans to English North America, the recruitment of English women to help establish families among the male settlers to bring stability to the colony, the first official English Thanksgiving in North America and the entrepreneurial and innovative spirit of the Virginia Colony. Commemoration events’ meetings have been moved from May to July 27-30 in Williamsburg. Details will appear in the forthcoming Society Magazine. 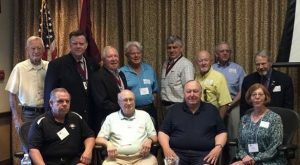 Bylaws Committee Chair Jim McCall presented revisions and amendments to the bylaws that the membership acted upon. 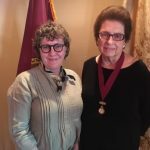 Outgoing Councilor Anita Guenin installed the 2018-2020 Council: Left to right: Outgoing Councilor Anita Guenin, Governor: Julie Plemmons, Lt. Governor: Marty Sommercamp, Secretary: Sandra Orozco, Treasurer: Richard Burke, Historian: Jim McCall, Chaplain: Sandy Bill, Councilor: Claire Murphy, and Councilor: Joanne Murphy, Absent: Councilor and Immediate Past Governor Scarlett Gathings Shepherd and Membership Chair and Past Governor Martha Gresham. 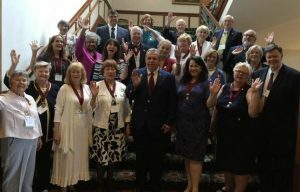 Councilor Anita Guenin installed the 2018-2020 Council. 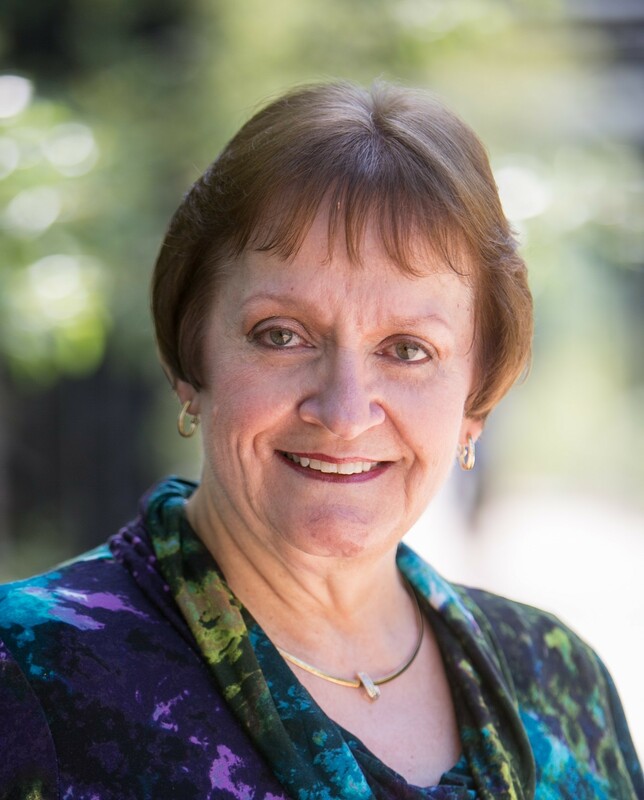 Our speaker will be Bonnie M. Harris, Ph.D., whose program will be A Foundation for Revolution: The Intersection of Religious and Civic Life in Jamestowne, 1607 to 1777. Dr. Harris is a lecturer in the Department of History at San Diego State University, Grossmont Community College District, and Southwestern Community College District. She is a descendant of Reverend Thomas Hampton, an Episcopal minister in James City Council and Williamsburg Parish. Cost: $45; including luncheon. Your reservations must be received by June 15, 2018. Parking is limited at the club, but friendly neighborhood parking and metered parking within three short walking blocks is available. Exit at Rosecrans Street exit. 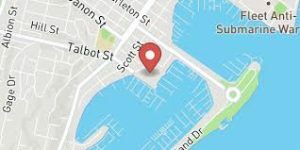 Follow Rosecrans Street until you reach Talbot Street (3½ miles, to third street past Shelter Island Drive). Turn left and go to Anchorage Lane. Exit at Hawthorne (airport exit). Follow to Harbor Drive toward Pt. Loma. Turn left on Rosecrans Street (signal). Go a few blocks to Talbot Street (signal). Make a left turn and go to Anchorage Lane.